So, the result of my conversations with Duncan Sutherland on whether you could piggyback a successful bricks and mortar retail outlet on to a successful e-tailer like Bigoffers.co.uk was that Duncan persuaded me to have a go. 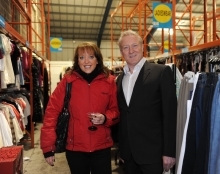 Bigoffers opened its doors in the Dalry area of Edinburgh last week. The retail shop carries a wide range of consumer products all at attractive discounted prices. Looking around, you’ve got to be amazed at some of the terrific value for money offers in there. The opening day was quite busy and of course Duncan and I were there to get instant feedback from the most important and knowledgeable critics of a new business – its customers. Now I thought we had got a good solution to all of these essential ingredients. It turns out that one of them will remain unproven for a while. After all we know that the Dalry area holds a lot of people looking for excellent value for money in discount outlets. Premises at this time in the business cycle and given the credit crunch are, frankly, going for a song. Landlords are willing to negotiate rents low enough to reduce risk for the tenant even if they only cover the cost of keeping the property wind and watertight. As for people, well first and foremost we’ve got Duncan to cast his beady eye over the venture. In the marketplace right now, again because of economic circumstances, there is a huge pool of talent looking for work. There are new graduates and people let go by companies that are tightening their belts and down sizing. They are all keen to find exciting and interesting work. So we can definitely get the quality of person we need. You can now see the one crucial matter we haven’t tested properly yet – footfall. We were not to know that our opening of the outlet would coincide with snow that made Edinburgh more or less grind to a halt for a couple of weeks. So we shall see how things go when the thaw comes; but I feel confident that we have got the risk as low as possible and I think the idea will fly. Be prepared if you are going to set up a new retail outlet whether it’s a barber shop or a department store to work harder than you have ever worked before. Entrepreneurship is nine parts perspiration to one part inspiration. If you have confidence in the people you need to make a venture work you are in the best shape possible.